Take your pick: outstanding golfer, outstanding teacher, good enough singer to have his own Las Vegas lounge act, or great storyteller. Mr. Jimmie Bullard is all of the above. 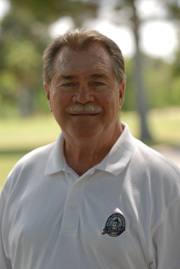 But Bullard is perhaps best known as the swing coach behind so many of Las Vegas’ top golfers: to name just a few, he’s helped fellow 2009 Hall of Fame inductee Edward Fryatt, past inductee Brady Exber, likely future inductee Stephanie Louden, long driving champions like Corey Morley and Art Sellinger, and celebrities like Max Baer Jr. and Doug Sanders. Jimmie was a high school champion golfer in Kansas, before playing college golf at Oklahoma State. He had a couple stints on the PGA Tour, with two top-five finishes, before settling into a teaching career that spanned four decades at the time of his induction in 2009. He has taught in Las Vegas at a number of different area clubs including Las Vegas Golf Club and Highland Falls Golf Club. Bullard is a man who admits to being obsessed with golf, and he always says his favorite golf lesson is “the next one I’m going to give.” Bullard also battled various health issues over his career, never letting his misfortune get in the way of helping his students.